This balsa tower was 12 inches tall, 8 inches wide at the base, and tapered to a 2 inch square at the top. I only have about forty pounds of sand, so I ended up adding any heavy object in sight to the bucket. After putting in the ceramic mug used to pour the sand, a chain, paper weights, the total weight supported was 50 pounds. The tower did not actually break, but one of the legs was bending almost to the point of breaking. The efficiency score was just over 2000. As you can see, instead of using X’s, I only have a zig-zag pattern. That was because I wanted to see if I could “trick” the system. In a tower like the one above, the four legs are in compression. When the load is applied perfectly vertically, the rest of the members have no load until the legs begin to twist or bend. Because the legs are square pieces, they have equal resistant to bending in all directions. The X’s only serve to break the main legs into smaller sections, which increase the strength. What kind of balsa wood is that? Do you have a video or something on how to build this? Zoe, I do not have a video on how to build this balsa tower. The best I have are the pictures on this page. Hi Garrett, how do you glue the 4 legs together to make the perfect square base and the top square? I am havinga lot of trouble with this. Did you need to sand out an angle for the 4 lets to connect tothe squares? I first made two sides, and then worked on joining them together. And yes, I sanded the corners down to get the correct angle. I believe I waited until after the 4 sides were connected though, and put some sandpaper flat on my work table, and simple rubbed each corner down to the until it was right. I also used a small level on the top to make sure it was level in all directions. Ok thank you Garrett. I am wondering now how would you connect the base of the tower to a main tower frame in thr 2017 event list requirements. The requirements are after 20 cm of the tower, the top must fit through an 8 cm radius. So builsing the base seperate from the 8 cm radius main tower, how would you connect it as accurstely and smooth as possible? I’m pretty sure I made use of a plumb bob when connecting the top section and base of the tower. I don’t think I ever came up with a good jig. Are you doing Science Olympiad? I’d recommend giving at least a 1mm clearance from your rules so that it is clear to the judges that you are good to go. How heavy was the tower above? It must have been around 11 grams. 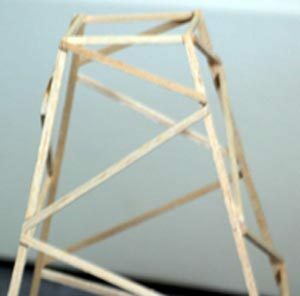 i m making model of tower and podium design… can u give any idea? How many feet of balsa wood did you use? Because I am doing an engineering project, and we are only allowed 24 ft. Also, we can only make the base 5 x 5 inches. Do you see that as a problem? Do you believe this zig zag pattern is better or should I use a lateral bracing? Technically this zig-zag pattern is a type of lateral bracing. In answer to your question, I am doubtful if this method is the most efficient. Was this tower for Science Olympiad? and did you win? 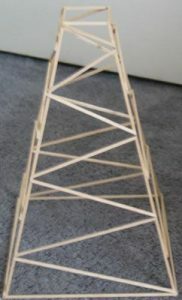 John, I built this tower during my time in Science Olympiad, although this tower wasn’t to the specs. I was testing some new concepts for me at the time. To be a true SO tower I would have had to have built an upper section for the tower. Great tips!!! I have used your site for boomilevers, bridges and now towers. So far I have gotten great tips along with the science. Thanks for the good grades. The tower I need to construct has to be 35 cm (13.8 inches) in height, just a little bit taller than yours. Your design looks good but I will only make it a little bit taller for mine. Randy, thanks for sharing. However, I don’t quite understand how you are calculating the efficiency. The way I would do it is to divide 110 pounds by 2.2. This is to get kilograms. Then I would multiply that by 1000 to get the mass held in grams. Then I would simply divide that number by 6 (the weight of the tower) to get the efficiency. The score I calculated for your tower was 6250, which is an incredible score. I am a teachers aide at the Middle School in a Technology Lab. We construct this type of towers for the 7th & 8th Grade students. 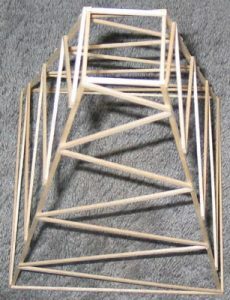 I reconstructed this tower using our pattern guidelines. The guidelines for our towers are 8 inches tall, and 15 grams is weight. My tower was 8 inches tall and the total weight was 6 grams. I tested it using the tower tester we test the student towers. It was designed by the Pitsco company from Pittsburg, Kansas (www.pitsco.com). After testing my tower it held 110 pounds of weight before the tower failed. To test the efficiency of my tower I used the efficiency chart that the 6th grade students use to test the truss ( side of a bridge) made out of paper straws and glue. Their efficiency is measured by dividing the weight held by the truss to the weight of the truss itself. Dividing the weight held by the weight of the tower I found that my tower’s efficiency was 32.49%. did you do your sides just like him? and also, how wide was your base and top? The tower you made seems to be very efficient. May I know where to get the guidelines from and how you got it? 45 queries in 0.434 seconds.